Over the past few months, I’ve gradually been collecting all the gear I need to install a RedArc Dual Battery System into my Mitsubishi PB Challenger. It’s the biggest modification to the vehicle that I’ve taken on myself. But it won’t be the last. 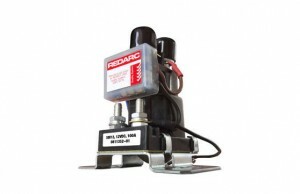 The RedArc dual battery system that I’ve purchased is the RedArc SBI12 solenoid. The instructions couldn’t be simpler. Basically, all I need to do is bolt it on and connect some wires! 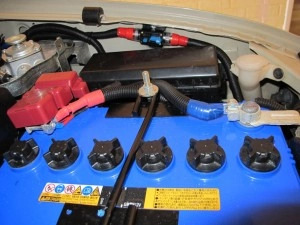 I wanted a dual battery system that is robust and reliable when in the vehicle, but also one that was somewhat portable (If you’re after my second take and a more permanent solution, check out the table of contents above for the “How To Set Up A Permanent Duel Battery Setup” section. ). Well, not the entire system, but the battery itself. 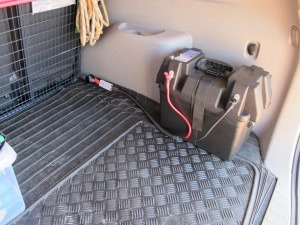 I want to be able to remove the battery from my vehicle when I arrive at a destination so that I can lug the battery and the fridge away from my car if I need to. This will also allow me to remove the battery easily when I’m at home so that I can run it on my battery conditioner when it’s not in use. And also reduce the weight that my vehicle will need to lug around when driving around the city. Eventually, we may purchase a camper trailer that will need another battery in it. So my dual battery system installation will need to be expandable to extend to a trailer as well. 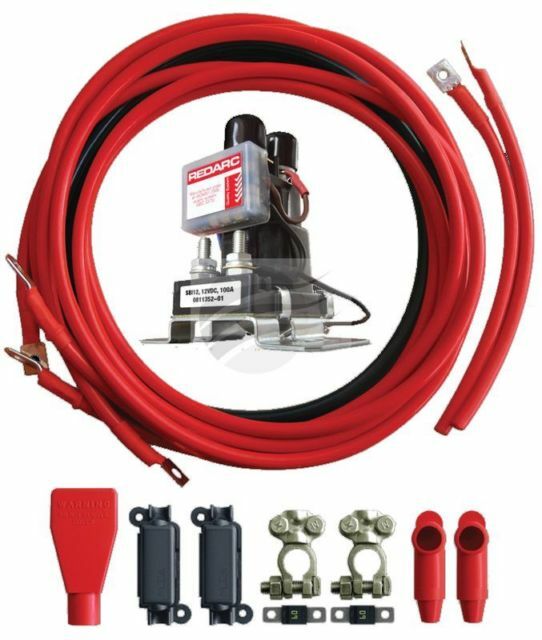 With that in mind, I looked through the RedArc website and found the RedArc SBI wiring guide that best suited my needs. Now this design in itself isn’t perfect for my requirements. If I want to be able to remove my first aux battery then I need an additional Anderson plug connecting to my first Auxiliary battery. But this is a very, very minor change to the overall design and shouldn’t cause me any real problems at all. 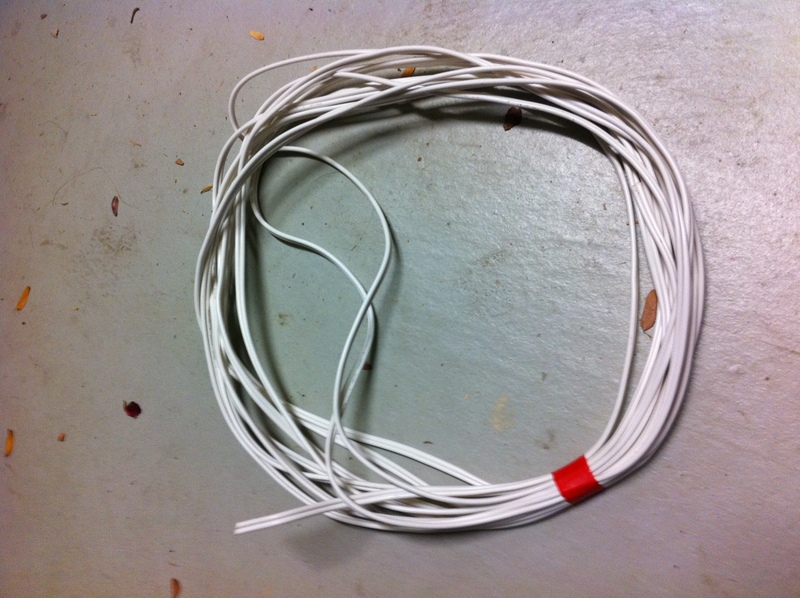 6B&S Cable (Red and Black) – This was recommended so that I’d get minimal voltage drop over the cable. RedArc SBI12 Dual Battery Isolator. 100 AH AGM Battery to go in my boot (See my un-scientific test on Battery life and my ARB 78L Fridge). 2 x 60 amp circuit breakers to protect everything. The wiring guide recommends 100 amp fuses so I may change these to 100 amp breakers at a later date. Since I wrote this article, It looks like RedArc has released an installation kit which includes most of the items you need (i would still recommend you buy the split tubing to neaten things up) and means you don’t need to buy any of the specialist toolings. I personally buy most of my gear from them as they are basically the Repco of the online world without the inflated pricing. By far the cheapest place to buy this kit is Sparesbox.com.au and I would personally recommend buying it from Spares Box as they are based in Australia, have a 1300 number and you can even chat to them online if you need help and best of all its free shipping over $50. Your protected by Aussie consumer laws so if it’s not right you can get a refund. You can find the kit by clicking Here. From there, I decided to start with what I thought was the easy bits; Finding a location for, and installing the RedArc SBI Isolator. Looking under my bonnet, there isn’t very much room and every surface seems to already have something on it! Eventually, I decided on placing it high up, on the driver’s side. It’s further from the cranking battery than I’d like, but I don’t really think I had much choice. As it turns out, these were indeed the easy bits. Installing it was pretty simple really. Just a couple of self tapping screws. To get a really good earth, I used a grinding drill bit to grind back to bare metal then popped a screw in and sprayed over it with some rust preventing paint. Quick and simple. Once that was installed, I started making up the cable I needed to connect it to the cranking battery. This was simply a matter of measuring the correct lengths, using the swaging tool to crimp the lugs on when needed, and installing the circuit breaker. At this point I tested the system in a couple of ways. The first was with a multimeter which told me that it was all working perfectly. The 2nd was to turn on my engine and run it for a while. Once the main cranking battery was fully charged (which didn’t take long) the RedArc isolator turned on. This means that if a 2nd battery was plugged in, then it would now be charging as well. I then turned off the ignition and noted that the RedArc isolator remained on. So I turned on my lights to drain the main cranking battery just slightly. The RedArc isolator detected the voltage drop after a short time and turned itself off. So this means that if I had a fridge attached to the 2nd battery, the RedArc isolator would have cut the connection back to the main cranking battery, leaving the fridge to run only off the second battery. Perfect. So for this part I needed some help. Not because the electrics were going to be harder, but because I had no idea about how to get cables from the engine bay to the boot. As it turned out, this was quite simple. Firstly, to get from the engine bay to the passenger compartment, I had to run a cable through the firewall. There are little rubber grommets that you can use to push the cable through. I used a drill to make a hole in the rubber grommet. 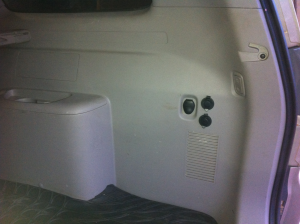 Once you’re in the passenger area, pulling up the trim is quite simple. You get your fingers under it and give it a bit of a yank, basically. I’d been advised that running the earth cable all the way back to the cranking battery was a good idea. Apparently, this helps prevent voltage drop. So if you were to use the override button and start your vehicle from the second battery, you’d have more chance of success. And so now I have my dual battery system completely set up and working. My second battery can sit in my boot, but is removable if required. So to continue my RedArc Dual Battery Setup, I’ve now wired up a little LED on the dashboard that tells me when it’s activated and passing power to the auxiliary battery. It is a very simple task to wire it up and it’s part of the standard features offered by the RedArc SBI12 Dual Battery Isolator, and the wiring instructions can be found in the RedArc Isolator instruction sheet provided with the product. 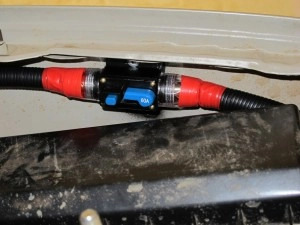 It’s a very simple matter of connecting the override cable to the + side of an LED, earthing the LED and then drilling it into your dash. I purchased a length of double speaker cable from Bunnings for this job, and borrowed my dad’s soldering iron. Now here is a tip for you… When you’re working around your engine, be patient and let the engine cool down first. 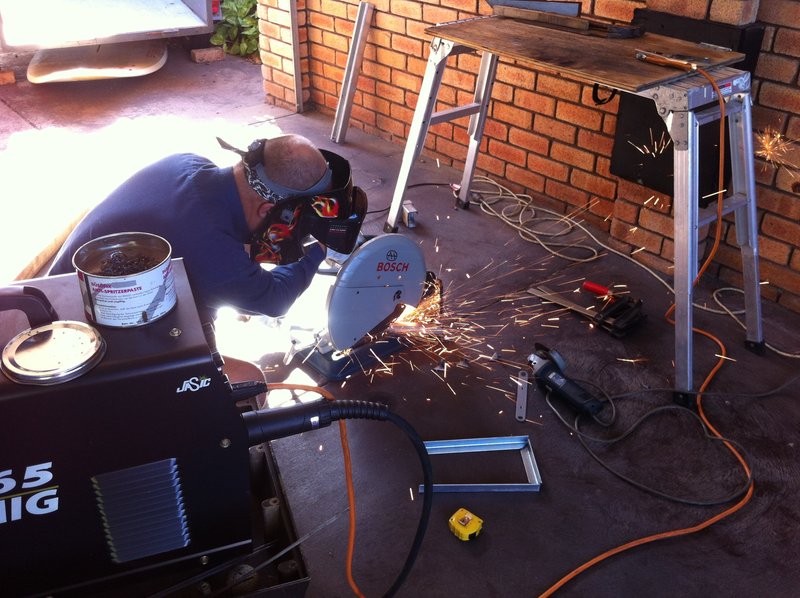 I learnt that from experience… But after my trip to Bunnings, I was all keen to get started. I also purchased a 12v red LED for the dashboard. I bought a 12v LED because otherwise, I’d have to purchase a resistor for when I install the override button as well. I think I’ll install that under the bonnet rather than drilling a big hole into my dash. I decided that the simplest place to earth the whole setup was back at the same place I’d earthed the RedArc Dual Battery System Isolator earlier. And that’s part of the reason I bought the double speaker cable. The scariest part was drilling into my dashboard! Not that it was hard, but that it is very visible. You’re drilling into your dashboard! Once it’s started you can’t un-start it! Anyway, all went well and now I have a very cool little LED that lights up nicely when the isolator does its thing. The battery in the boot takes up too much room. 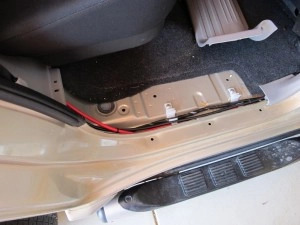 When I was originally installing my dual battery setup, my cousin and I removed the trim in the boot and I mentioned to him how much space there was back there. I remember telling him that one day, I might put the battery in there somehow. And so that’s where I decided to put it. But my problem was that there are no flat surfaces behind there. So you can’t just buy a battery tray, bolt it to the floor and put the battery in. 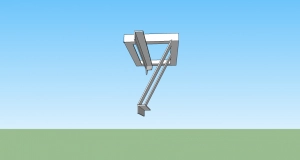 You need to build yourself some kind of bracket. So I asked on a forum if anyone had any idea about how this might be possible and got exactly the response I needed almost immediately. 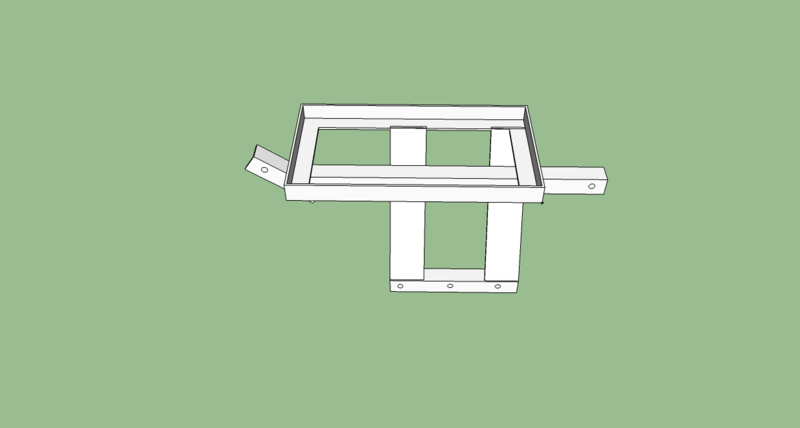 The forum member had not only successfully built a battery bracket, but had installed it and also designed it in Trimble Sketchup, an application that I have recently started playing with. His design didn’t quite fit my requirements but only some very minor modifications were required to get me on track. So using Trimble Sketchup, I made the changes I needed and ended up with something that I thought would be perfect for what I needed. 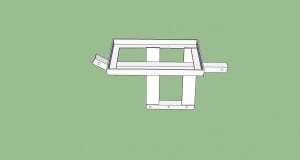 You can download the Battery Tray Sketchup File if you like. NOTE: Measurements should be double checked before you build it! Basically, the difference between mine and his was that he purchased a battery tray whereas I designed in a rectangular frame that the battery would fit into. The frame is then supported by a cross beam and two legs that bolt into the vehicle. My next problem was actually welding it together. I’ve had some very, very limited experience with welding, and also didn’t have access to a welder anyway. I was discussing this dilemma with a friend of mine at the 4wd club and he told me that he was a plumber and welding was part of his job. He also owns a MIG welder and metal cutting circular saw. So we arranged to get together and build it up. So on the day, I provided the design and he provided the know-how and we put together a frame that will be the last thing left of my car when they drop a bomb on it. 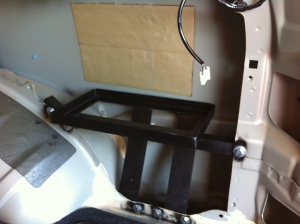 Once the frame was all done up, it was time to install it into the car. This involved drilling some holes at appropriate places and attaching it with 8mm bolts and nylock nuts. I then put the battery in place and noticed that the upper rear corner of the battery touched the outer shell of the car. So leaving it like that would eventually bulge the body work outwards. To fix this, I needed to lean the battery inwards a little so I cut come pieces off and old towel and put them into the back of the battery bracket. The battery now leans inwards slightly and is about 8mm off the bodywork so hopefully, that will be OK. If I were to make the bracket again, I’d move the battery tray about a centimetre inwards, away from the bodywork. Then there would be plenty of room for it all to fit. After I’d ensured that the battery wouldn’t hit the body work anymore, I strapped it down firmly with some tie-downs that I got from Bunnings. That battery won’t move anywhere now! 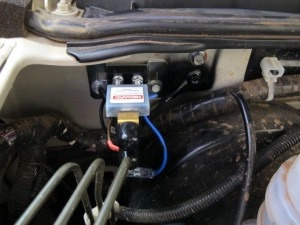 In addition to wiring up an Anderson plug on the tow bar, I also wired in a small fuse box. From the fuse box I have then connected 3 12v power sockets in the boot. The existing one and I’ve added two others. Into these I’ll plug in my car fridge, some LED light strips when I need them, and anything else that comes along. Drilling through the trim and cutting large holes in it to put the 12v sockets into was exciting. Not difficult, but there was a lot of checking and rechecking to make sure that the back of the sockets would fit once the trim went back on. It took a bit of courage to commit to it. But I’m very happy with the results! Eventually, I’ll also run a cable from the second battery to my UHF radio in the dash. At the moment the UHF is wired to my cranking battery and turns on and off with the ignition. That’s not ideal for me. I’ll also attach a couple more 12v sockets to it that will sit on my rear draw system when it’s built. My son will then be able to plug in his iPad Mini and keep it charged when we’re out and about. Wow, it seems like an awful lot of trouble for just 3 sockets in my boot… But once the camper comes along and I get around to finishing off my other plans, then there will be more. After some playing around with the multimeter which didn’t really help, I decided to pull it all off again and see what was what. When I pulled it off, I noticed that the anti-rust spray paint had got down between my earth cable and the body work. So I got out my grinding drill bit and ground the paint back off again. This time, when I turned the engine on, the RedArc behaved as it should and the whole system started working. Phew! So make sure you’ve got a good earth from the RedArc SBI12. Lesson 2: There is an awful lot of room behind the trim in the boot area. I’m seriously considering permanently mounting the battery behind there at some stage. It’d save a whole lot of space in my boot. The battery wouldn’t be removable anymore, but I’m sure I could live with that. Lesson 3: Take your time and do it right. Make sure you do a proper job of it from the start. And once you’re done, make sure you have time to sit back and look at it. It’s very satisfying doing things like this yourself, so take the time to pat yourself on the back when it’s done. Lesson 4: So I was reading through the warranty information for the RedArc Dual Battery Isolator and I noticed that is says that the warranty is void if it’s purchased from an online auction site from a non-authorised reseller! So if you’re buying online, make sure the person you’re purchasing from is an authorised reseller. Sparesbox.com.au(where I got mine) is an authorised reseller. Looks like a really neat installation and im trying to figure out a way to do something like this myself. Where are your vehicle auxilliaries wired to? Either you have them wired to your main battery in which case your isolator will not orotect your starting in the morning or you have them wired to your auxilliary battery which will only work when the auxilliary battery is in place. What happens when you remove it? Do you have a waiting period before the solenoid kicks in and the auxilliaries fire up or have i missed something? At the moment, the only thing that I plug into my 2nd battery is my ARB Car fridge. When the fridge isn’t in the car then neither is the battery. That’ll change when we get a camper trailer. I’m sure we’ll find other things to plug in then. The only other additional thing that I have in my car at the moment is my UHF CB Radio and that’s wired to the cranking battery. But it’s only on when the ignition is on and doesn’t draw much anyway. The solenoid basically works by monitoring the voltage output of your cranking battery. 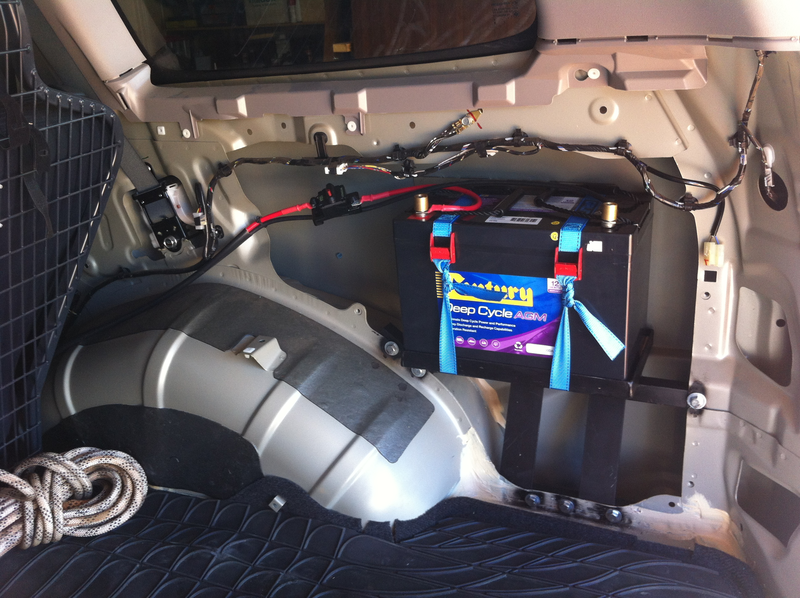 With your engine turned off, as the cranking battery drops below a certain voltage, then it isolates that battery. 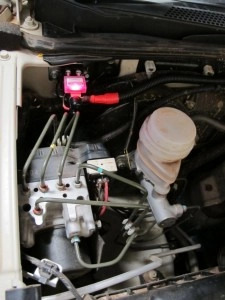 When you start your engine, the cranking battery starts to charge from the alternator. When it reaches a certain voltage then the solenoid allows the charge to travel back to your second battery and that also starts to charge. If you had other devices attached to your secondary battery circuit with the 2nd battery detached then they wouldn’t be powered when the isolator is isolating. But I guess when the isolator switches over then those devices would start to get power… I don’t see why they wouldn’t… So yep. There would be a short delay between starting your engine and your devices getting power. For me the ultimate is to have your setup (removable aux battery) with a way to have all accessories run from the aux battery when its plugged in. Its the least risk scenario but doesnt seem to be available. Top blog mate, I’ve been looking for something like this for a while. In fact, I’m going to start this job on the weekend as I’ve got 4 weeks to go before I take the Challenger off to the Simpson! G’Day mate. Thanks for the comments. Setting up the dual battery system was pretty straight forward. Just make sure you follow the instructions and you’ll be all good. Have an awesome time out in the Simpson! If you’re up for it, check out http://www.4x4wiki.com and write up a trip report!! If not then post up some photos on a forum somewhere and let us know where they are. I’d be very keen on seeing them and hearing how you went! Very neat installation and great blog post. I look forward to following your blog and reading up on all your adventures. It’s always good fun doing stuff like this. And I’ve just got myself a camper trailer so I’ll be able to extend the system into there now! Can’t wait! More posts about that to follow as I get to it. Why would you not be able to connect lights up to this battery? 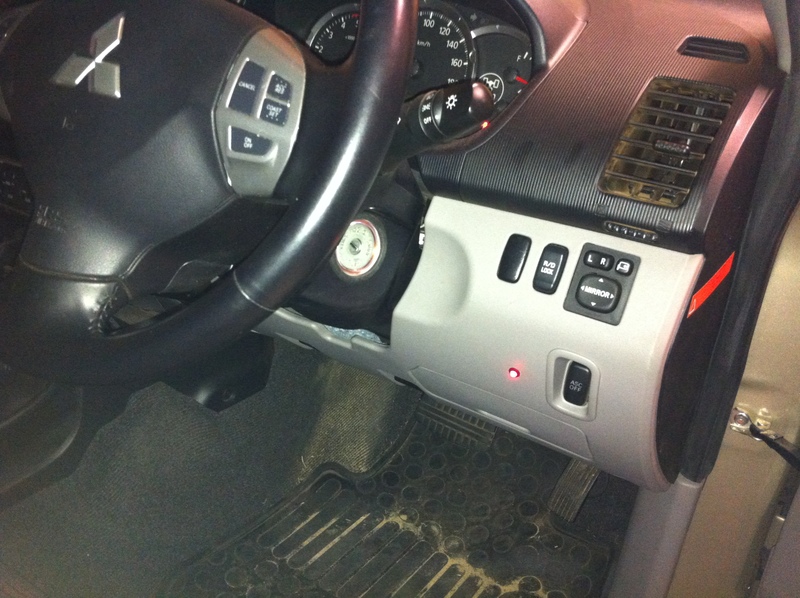 Have you had any issues with the challenger having a smart alternator and there you requiring a dc charger? Good info guys, I too am after a system that offers flexibility, I want to able to remove the aux battery at camp or when not on 4wd trips and have it at home on the charge. Y’know, when I initially set mine up I had the same thought… If all my accessories are attached to the removable battery then what happens to them when I remove the battery? They don’t work. But I’m no expert so keep asking around. Anyone else got any thoughts? Dale. The little blue wire can be attached to a push-button switch. So if your cranking battery goes flat, you press and hold the button and you can crank your car off your 2nd battery instead. It’s a backup system. Pretty clever really! Hi, I’m Jimmy Mitchell and I love exploring the off beaten tracks with my wife and two boys. 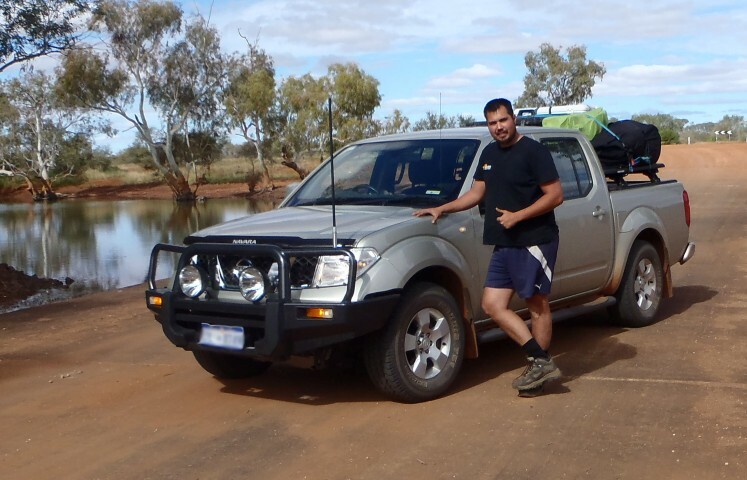 As an avid 4 wheel driver, I’m very keen to share my experiences and adventures. On this blog, I share all the things I learn about Off-Roading as I go. This site is owned and operated by Jamline Enterprises is a participant in the Amazon Services LLC Associates Program, an affiliate advertising program designed to provide a means for sites to earn advertising fees by advertising and linking to Amazon.com. Jamline Enterprises also participates in affiliate programs with commissionfactory.com. Jamline Enterprises is compensated for referring traffic and business to these companies.